First off, let me apologize for not keeping up with the 30 Day Writing Challenge. It has indeed been, well…a challenge! Between my duties as a teacher, a mother, and a doctoral student (along with a few other roles), I have been OVERWHELMED! I’ve been so overwhelmed, that my body waved the white flag this week in response to my demands. I’ve been sidelined with a respiratory infection. The codeine in the cough syrup I was prescribed has activated some form of hyperactivity, and as a result, I am preparing for Thanksgiving next week. Yes…you read that correctly: I have already begun my Thanksgiving preparation. I will NOT be running around my house like a mad woman, unshowered and undressed when my guests arrive! Here are a few things I’m doing NOW to get ready for Thursday. Take this weekend to clean, especially the pantry, the cupboards, and the refrigerator/freezer. One of my side hustles is to bake rum cakes, so I typically rotate my baking supplies regularly. If the only time you bake is during the holidays, you will want to check the expiration dates on things you don’t use regularly like baking soda, baking powder, spices, extracts, corn meal, flour (cake and regular), and other cooking supplies. Add them to your grocery list NOW. Cleaning also provides space for the additional groceries you’ll pick up over the next few days, which will likely be more than you usually have, and require the additional space. Speaking of grocery lists…did you recycle your sales papers already? If you did, no problem. Be sure to pull them up online; thoroughly going through each one so you’re getting the best deals on the items you need. Preparing a grocery list means preparing a menu. This year, I’m sealing Thanksgiving Dinner with a KISS: Keeping It Simple and Sweet. I only have one day off to prepare for Thanksgiving, but a few days off to prepare for Christmas. Christmas is a month after Thanksgiving, so many of the items you serve on Thanksgiving will be served again on Christmas. Don’t wear your guests out with repeats. Do a simple Thanksgiving dinner with maybe one new side dish or dessert, then jazz up Christmas. Clean your pots, pans, dishes and serving trays. Like the baking supplies, many of these items haven’t been used in almost a year, too. It’s a good time to wash the roasting pan and rack, or the serving platters. Also, throw the tablecloths and chair covers in the washing machine so they can be cleaned, dried, and ironed this weekend. Remember your list! Add any supplies you may need like disposable pans, roaster liners, or additional cutlery. Once you have everything cleaned, dried, and put away, you can begin some basic kitchen preparations. Measure out your dry ingredients and seal them in a storage bag; labeling what it will be used for. Bookmark, download, and/or print needed recipes. Organize your counter space to make supplies readily accessible. As Michael Jackson sang, you are not alone! Don’t try to be the hero. If someone asks what can they bring, give them a honest answer! Let them bring a side dish, a dessert, or even beverages. You will not lose Brownie Points for not cooking absolutely everything on your Thanksgiving menu. Solicit the help of others, if possible, on the cleaning and cooking, too. I hope these few tips help! Have a wonderful Thanksgiving! Today’s challenge is to write about a book I love, and I book I did not like. I have been on a journey I call the EdD Chronices for the past two years. That means that my time to leisurely read is greatly diminished. Even what I read scholarly is typically limited to a 250-word synopsis. The limitation on my social reading is one of the reasons why I love my favorite book. Rather I’m reading chapters, or just simply a verse or two, I can summarize it into three simple words: God loves me. My favorite book is the Bible, and each time I read it, I learn something new. It has great mysteries, more scandal than any ABC drama, and is full of inspiration. And, it’s a book you don’t have to start from the beginning. What other book can you start in the middle, or at the end, and still get the theme and plot? On the opposite end of the spectrum, Sula by Toni Morrison is probably one of the worst books I’ve ever read. It had too much figurative language, and too much imagery that it made the text difficult to navigate. Reading it was more of a burden than a blessing. Perhaps I’ll try reading it again someday, but for now, it remains of my “do not touch” list. Whatever books you love or hate, keep reading. The doors it will open for you in life are endless. Before I begin, let me start by saying that I am aware that today is actually the seventh day of the month. I’ve been out-of-sorts all week. If it hasn’t been one thing, it’s been another. My faith, my courage, my drive have all been greatly diminished. By yesterday (Day 6), I was completely drained. I rested and decided to take on the challenge of writing today. No, my situation(s) have not changed, but my outlook has. Victory is mine, so on to the task at hand. The Oxford Dictionary defines fascinate as: [to] draw irresistibly the attention and interest of (someone). The truth is, I am interested in a lot of people but to say that they’re irresistible is not accurate. Intrigued with or inspired by? Certainly. That’s what fascinate means to me. The things that interest me about people are more so their attributes and character traits than anything, but physical characteristics sometimes play a part. For example, I am fascinated by the actor Idris Elba purely because of his amazing looks and superb acting ability (further enhanced by his amazing looks). I am fascinated by people who display great courage in the face of adversity. People like my She-ro, Candace Henley. Candace is a colon cancer survivor and advocate who has turned her adversity into advocacy for greater awareness and testing, especially in the African-American community. I am fascinated by people who walk unashamedly in their faith. People like Rev. Courtney Clayton-Jenkins, a young woman who is also a pastor, a pastor’s wife, and a mother. She recently published her first book designed to encourage and empower women in leadership. People generally have a love-hate relationship with tattoos. To each his own. I happen to love them, therefore, I have tattoos. Like many people who opt to get them, I got my first one in college. It was an 8th note with a rose as the base. It was small, because I was scared when I got it. It represented my love for music. A few years later, I’d met and married my soul mate, and a friend of mine convinced me to go to a tattoo party with her. I got that small tattoo covered up. It became a much larger rose with my husband’s name going through it. It represented my love for my husband. Shortly after that, I got my next tattoo. It is an angel with my daughters’ names around it. It represents my love for my three angels. My last (but not final) tattoo was added to the collection a few years ago. I went back to my first love, music, and got a heart that is made from a treble and bass clef symbol. From it is flowing a music staff. My next tattoo is already planned. 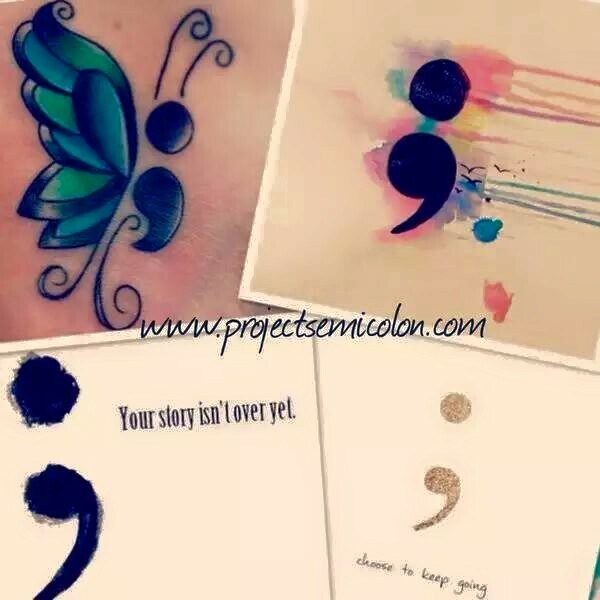 It will be a semicolon butterfly in support of Project Semicolon. This post couldn’t have come at a more opportune time. With the recent murder of nine-year-old Tyshawn Lee, I am officially beyond fed up with living near Chicago, Illinois. I thought moving from the city to the suburbs three years ago would help, but it hasn’t. Besides the violence, Chicago is one of the most segregated cities in the United States. As a teacher, I see the racial disparities first hand in our classrooms; classrooms that have been labeled more segregated now than they were 60 years ago when Brown v. Board of Ed was reached. So, when asked where I would move, I would consider moving South in a heartbeat. Living is easy. People tend to be more respectful, and many Southern states have become more integrated than Chicago! I would consider South Carolina because it is not too far from another state I have visited and would consider living in – North Carolina. South Carolina is also close to the ocean. That’s definitely a plus. To be away from the harsh winters of Chicago would certainly be an added bonus! 10. I wash my hands first before I wash anything else on my body because my mindset is: why clean your body with dirty hands? 9. My early career aspirations were: a corporate lawyer, an accountant, or an actress. Never in my wildest dreams did I imagine I would become a teacher! Since becoming a teacher, I briefly considered going to law school to pursue a degree in Educational Law. I decided to pursue my doctorate in Teacher Leadership instead. 8. I was a sign language interpreter at church in my adolescent years. I still remember the alphabet and a few words. 7. I could eat Mexican food everyday. 6. I have a hard time accepting complements. 5. I am truly a jack of all trades and a master of none. 4. I have a very strong dislike for spiders. 3. Although I am 5’8″ tall, I love high-heeled shoes! I will rock a pair of 5″ stilettos in a heartbeat (as long as I’m not at work). 2. I am proud of the fact that I do not have problem sleeping. I lay down and am out in a matter of seconds, and I typically sleep all night. 1. I have close to 2,000 pictures in my phone. Many of them are selfies, but because I’m so critical of myself, I won’t post them (see #6). I love to love. I love to be loved. So, in thinking about how to tackle the task of writing about my first love, I briefly considered the tales of relationships past. Though few and far between, they weren’t really worth digging through the closets of my past to rehash pleasantly forgotten memories. I decided instead to approach this task from another angle. My first love is my mother! And, she’s my first kiss, too. 40 years later, she’s still my latest and greatest inspiration. She was my first teacher and has become one of my best friends. The woman I am today is because of her guidance. She is a model of wisdom and grace. I’ve loved her from the first moment I laid eyes on her, and will continue to love her for a lifetime and beyond.